The Pies surge home with the last five goals of the game with two down on the bench to take away a memorable victory. Collingwood strike again with an Elliot goal to get the Pies' first goal from an attacking midfield chain. After the Eagles converted four goals in a row, the Magpies have kicked the next three to bring the margin back to four points. The Eagles have now scored 7.2 (44) from chains in the attacking midfield whilst the Pies are yet to kick a goal from this zone. The Magpies lead disposals 41 to 20 and inside 50s six to two in the last term. 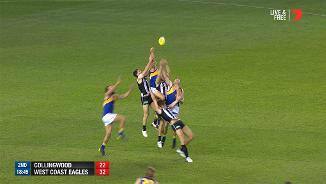 The Pies have recorded a kick to handball ration of 1.19 whilst the Eagles have a ratio of 1.46. West Coast and Collingwood are ranked 7th and 10th respectively in this area. The Eagles lead contested marks nine to two, intercept marks 12 to six and marks inside 50 14 to six. The Pies have won eight of the last 11 clearances of the game. Neither side has managed to convert a defensive 50 chain to a goal from 50 attempts. Jeremy Howe has gained the most metres on the ground with 390 metres. This is his third highest gain in the opening three quarters of a game this season. Josh Kennedy has continued his dominance into the second half with the first two goals of the third term. McGovern has again displayed his aerial dominance today with six marks (four from opposition kicks). His four intercept marks is his second highest return in a first half this year. Kennedy's tally of four goals is his highest first half return this season. The Eagles have scored 32 points from chains starting in the midfield zone, they have averaged 42.7 points from this zone in 2017. The Eagles have taken 10 marks inside 50 from 15 entries. Josh Kennedy leads the way with thee. The Pies have had first possession at 10 stoppages compared to West Coast's five, however they have been unable to turn this advantage into clearances where both teams are locked at seven each. Magpies InterchangeDarcy Moore and is possibly out for the game. Out of his three ruck contests against Vardy, Grundy has three hitouts to advantage. After the Pies had a run of nine inside 50s in a row, The Eagles have had six of the last seven forward 50 entries. Shannon Hurn has started the game with 10 early disposals at 100 per cent efficiency after his 34 disposal game against the Dockers last week. The Magpies have had the last eight inside 50s and now lead the count 11 to three. The Magpies have scored from four of their first six inside 50s. Throughout 2017, they have averaged a score from 44.5 per cent of entries (ranked 15th). 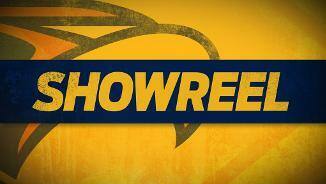 Josh Kennedy kicks the Eagles' first goal, which was sourced from a forward half intercept. The Eagles average 28 points launched from the attacking midfield (ranked 13th). Collingwood has generated an inside 50 from 24 per cent of its kickins this season which is the highest percentage recordedby a side. In the past four weeks, West Coast has averaged three more centre bounce clearances per game then its opposition which is the thirdbest differential recorded by a side. Welcome to Etihad Stadium for the Collingwood v West Coast Eagles Round 18 clash. 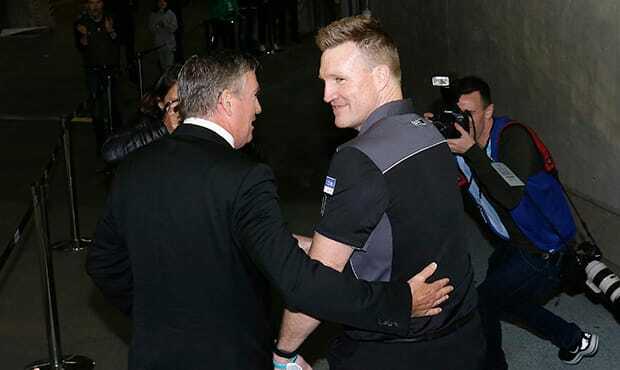 COLLINGWOOD has come from 18 points down with two fit men on the bench at three quarter time to upset West Coast in its bravest victory under Magpies coach Nathan Buckley. Jordan De Goey was the match winner with four second half goals and a game-changing tackle that allowed Jamie Elliott to kick the goal that gave the Magpies the lead with just two minutes to go. 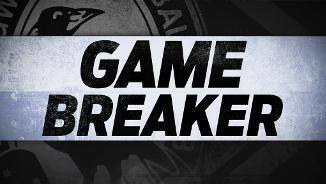 Collingwood kicked the final five goals of the game to win the dramatic contest 13.15 (93) to 13.7 (83) and tipped the Eagles out of the eight. It also kept its slim finals hopes alive and shows the team has rediscovered the purpose it seemed to lose a fortnight ago. On the other hand, West Coast were disappointing losing its fifth game away from home for the season and looking anything but a finals contender. It appeared to have the game in its keeping with just 10 minutes remaining when Elliot Yeo ran into an open goal but he missed and the door was left ajar. The Magpies worked through that door despite Darcy Moore being in hospital after injuring his neck three minutes into the second quarter and then losing Travis Varcoe to concussion just 10 minutes into the third quarter. When Varcoe left the ground during the third quarter Collingwood was 15 points down and Josh Kennedy was dominating in his 200th game. Kennedy had six goals on the board and looked to be leading a lack lustre Eagles to victory. But Collingwood came alive sparked by De Goey who kicked two consecutive goals and lifted the Magpies, who were led brilliantly by Steele Sidebottom who was standing in as skipper for the injured Scott Pendlebury. 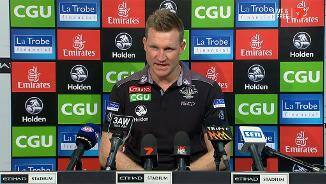 Collingwood coach Nathan Buckley said the contested ball numbers were one indication of the team's willingness to work hard, which the players had demonstrated for most of the season. 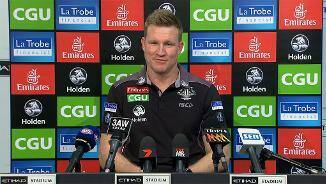 "They have got a will to compete and clearly a will to win," Buckley said. Levi Greenwood restricted Andrew Gaff to just 16 disposals, half his usual output and the Magpies dominated the inside 50s 56-45 and the clearances 37-29. 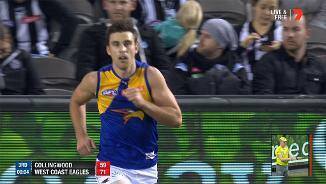 The 29-year-old Kennedy was too good for Tyson Goldsack in his milestone match taking six marks inside 50 and kicking six of the Eagles' first nine goals in just his second game back from injury. Lynden Dunn, who had never won against the Eagles in nine previous attempts, moved on to Kennedy and quelled him. "We were able to hang in there and that was enough," Buckley said. 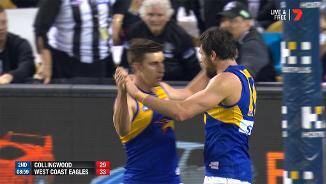 When Moore went off the Magpies went with a small forwardline and the Eagles struggled with the Magpies quick low kicks into attack as their intercept markers, Jeremy McGovern, Shannon Hurn and Tom Barrass were unable to control the game from the back half. After taking 10 intercept marks in the first half, the Eagles only managed two in the second half and the game changed. 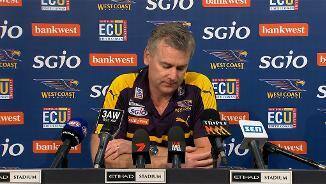 However shattered Eagles coach Adam Simpson said the loss occurred because of his team's inability to compete around the contest in the final quarter. "Your will to win, in the end, will win you some games," Simpson said. 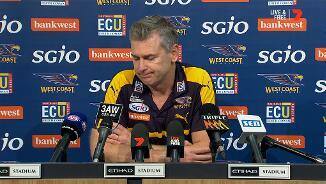 "Unfortunately, we didn't match Collingwood in that area. We got dominated around the ball. Grundy was too good for us in the end and gave pretty good supply. 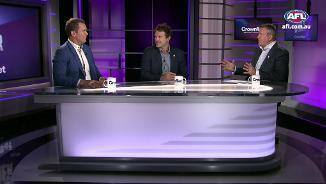 We just lost field position and momentum was hard to get back." Collingwood: Darcy Moore was taken to hospital for precautionary scans with a suspected neck injury. 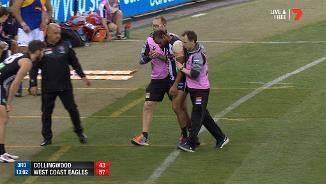 Travis Varcoe dislocated his elbow when concussed in the third quarter and went to hospital. The elbow injury could be season ending for Varcoe. West Coast: Jeremy McGovern copped a knock to knee in the first quarter but he recovered well and played out the game. Luke Shuey was kicked in the knee and left the ground in the last quarter but he did not look to have suffered a serious injury. 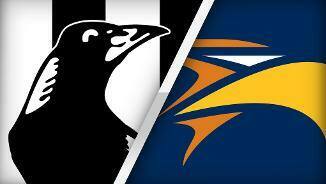 Collingwood will attempt to upset ladder leaders Adelaide at the MCG on Sunday as it looks to shape the finals. West Coast heads home with big question marks hovering over them and chasing a percentage boosting win over the Brisbane Lions at Domain Stadium.